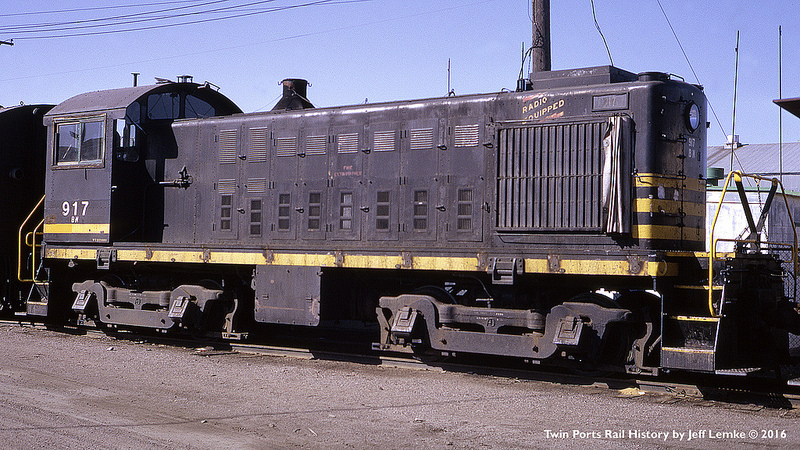 Northern Pacific 717 spent nearly 20 years working the Twin Ports area as a yard switcher. Twin Ports rail photographer and historian Jeff Lemke has graciously shared the following pictures of NP 717 at work in the Twin Ports. 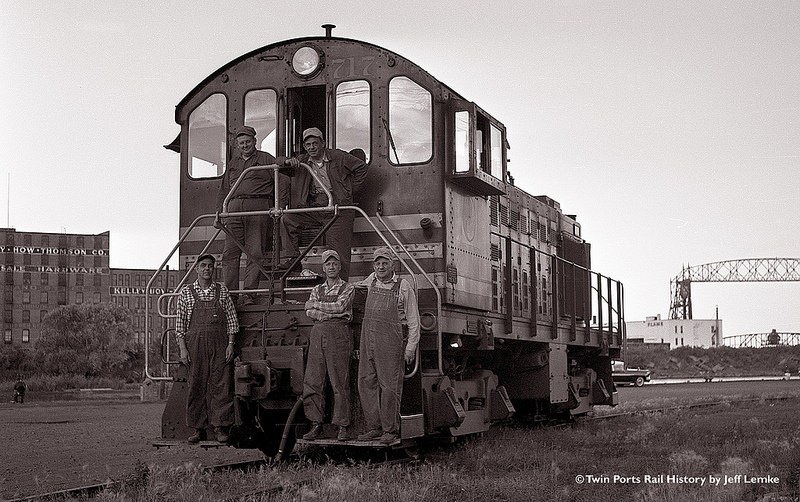 Jeff's caption for this photo states it's the crew on Northern Pacific's "Skunk Job" in the 1960s. The crew member names aren't listed, but consist of engineer, fireman, head brakeman, rear brakeman and conductor. Jeff says the job name derives from a couple factors, it was usually a 16 hour job working all the docks and industries in and around today's Canal Park area and because of the many food warehouses, the skunk population flourished in the area. In this photo, Jeff caught NP 717, now relettered as Burlington Northern 917 after it's retirement in 1973. The side hand rails had been removed and the old steam locomotive bell is removed. Jeff relates the railings were removed from the old Alco switchers in Duluth/Superior when they were retired in the early 70s and reapplied to Lake Superior, Terminal & Transfer NW2s 100-104 and older BN EMD switchers that still had the old style railings. See photos of NSP 4 to see what the old style switcher hand railings looked like. Seeing Jeff's photo above of BN 917 in the deadline at Superior might imply it was the end of the line for BN 917. Frequently, retired, but servicable locomotives are purchased by dealers and leased or resold to industries and shortlines. BN 917 and many of its retired Alco peers found new homes at elevators and shortlines via scrap dealers. BN 917 found its way to western Minnesota and a new career as a plant switcher for Southern Minnesota Beet Cooperative at its Renville, MN facility. It regained a bell (since stolen while stored at Montgomery), but never received new side railings. It continued to work at the Renville facility until a fire sidelined it in the late 1990s. Jeff Lemke is a Twin Ports rail photographer and historian. Jeff maintains an excellent website and blog sharing his knowledge and photos of Twin Ports railroad history. Jeff is also an avid model railroader. Check out his great photos of the Duluth/Superior rail scene from the 1950s through the 1970s under the "Zenith City Photo Gallery" section.